Health Promotion research papers discuss the process of enabling individuals to increase their control over their health ultimately improve their overall health. The World Health Organization (WHO) defines health promotion as the process of enabling individuals to increase their control over their health, allowing people to improve their overall health. Health promotion occurs largely through the development of public policy, addressing income, housing, employment, food security and workplace conditions, all of which can have positive or negative effects on a person’s health. Health promotion, at its most basic, helps people to change their lifestyles in an effort to move them towards optimum health. Health promotion first arose in a 1974 Canadian government report, one that aimed at informing the public to accept greater responsibility for their health and become more active in matters that affect physical wellness and mental health. The U.S. Surgeon General’s office released a report showing that more than 60% of Americans are not regularly active, and a full 25% are not active at all. This is despite numerous studies linking physical activity and overall general health benefits. Many programs exist in the workplace to promote health, including exercise, nutrition, smoking cessation, and stress management. The WHO has identified the workplace as the leading setting for health promotion because it offers the ideal setting and infrastructure for the support of programs that influence an individual’s healthy choices. 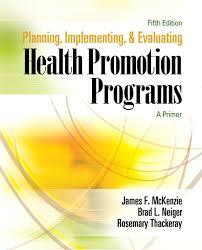 The Wellness Council of America is actively involved in workplace health promotion programs. National Health Education Standards research papers discuss the major reasons why health is taught in schools. Food and Drug Administration research papers look into the agency of the United States federal government responsible for the protection and promotion of public health. Paper Masters writes custom research papers on Health Promotion and discuss the process of enabling individuals to increase their control over their health ultimately improve their overall health.